What ingredients go into the chemical soup known as urban air pollution? Why do we have an Ozone Layer? Course Description Atmospheric Chemistry is a broad and multidisciplinary sub-field of Atmospheric Sciences that combines aspects of meteorology and chemistry to improve our understanding of major multi-scale problems such as urban and regional air pollution and global and polar ozone depletion. The course is an elective for the Meteorology BS, Earth and Environmental Sciences BS, and Chemistry BA and BS. It is also cross-listed as ESCI 5220 for graduate students. Check with your advisor about the Chemistry major, or check with me if you are a Meteorology or Earth and Environmental Sciences major. The course includes a semester-long project and presentation related to using hand-held, portable air monitors to test hypotheses about air quality variability. Usually students work in groups and the projects are centered near campus. 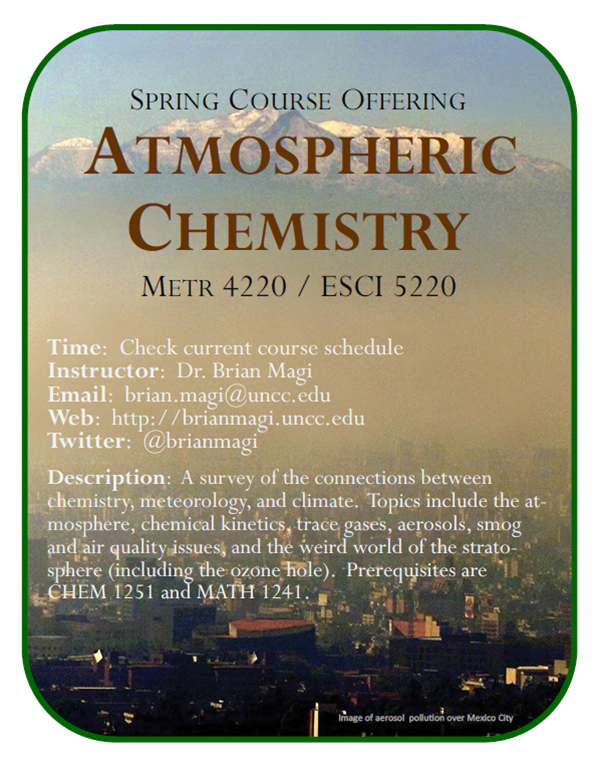 A really memorable day with unusually poor air quality affected Charlotte mid-November 2016, so this course helps students understand local, regional, and global scale air chemistry. Atmospheric chemistry directly and indirectly impacts climate and meteorology, but the chemical state of the atmosphere at any time is determined by the principles of chemistry and meteorology. In this course, we will discuss how basic physical chemistry and the Earth’s atmosphere are related. We will examine topics that include air quality, stratospheric chemistry, ozone depletion and the ozone hole. Throughout the semester, we will touch on the critical role that atmospheric chemistry plays in global warming. 2. Develop an understanding of how chemical processes in the atmosphere are part of the Earth System. Note that this course was listed as METR 4000 / ESCI 5000 for Spring 2012 and Spring 2013, which is the generic placeholder system at UNC Charlotte until a course is fully approved by various committees. Thus METR 4000 / ESCI 5000 evolved into METR 4220 / ESCI 5220. 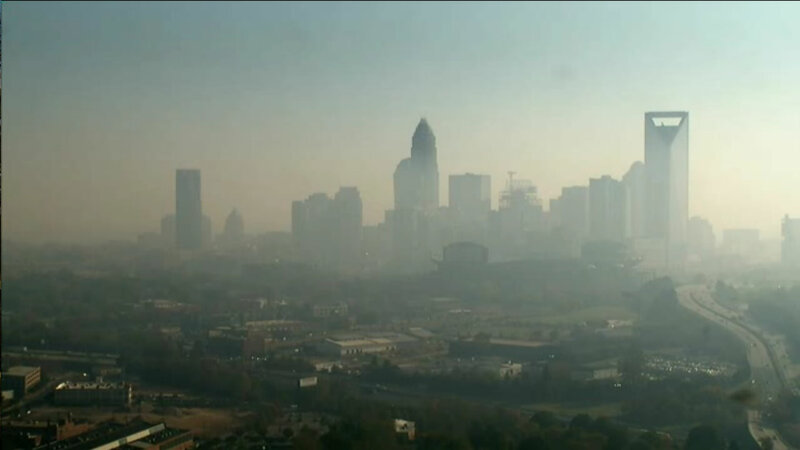 Image of Charlotte, North Carolina in November 2016 after smoke was transported from fires on the eastern NC Appalachian mountains. Air Quality Index was red for a day, which is really rare. Photo is from WBTV tower cam.